Its the end of the first week of sleep training and progress has been slow but the situation has definitely improved. We have been sticking to a consistent 3 hour routine of eat, activity, sleep. It is working well except that he has difficultly sleeping for longer than 1 sleep cycle (for him it is about 45 minutes including REM) per nap session. It is a mission trying to get him to have a full hour and 45 minutes. Sometimes I can transition him through, but with great difficulty. I am however learning a lot about Kien through this process. I now give him a dream feed around 10-11pm, and I only give him 1 feed during the night. After a few nights of experimenting I know he can last the distance. Whats more he is hardly even interested in his 7:30am bottle, so therefore I will soon be dropping the middle of the night feed. He is much easier to put down for a nap now that we have a routine. 15 minutes before his sleep time we go into the bedroom, draw the curtains, swaddle, and sit quietly to listen to one or two Sarah Brightman songs. By then Kien's eyes are rolling in the back of his head. I put him in his cot to the sound of brown noise played either from my iPhone or my netbook. I have been patting his back until he is completely asleep, but today all I have had to do is rest my hand on his chest for 5 minutes and he is asleep. Hopefully this is not just a fluke :-) He still only slept for 45 minutes and after doing everything I could think of to get him to sleep some more I gave him his pacifier. We took him to the beach again the other day. It was fun, although we had to hurry home to get him in bed for his last nap as he was getting really cranky. This week has been long and rough. From Friday through to Tuesday night Kien was very difficult to settle for his evening sleep, and then he would wake up at 3am and had difficulty getting back to sleep. I knew he wasn't napping very much during the day (and it was usually in my sling before I transitioned him to the hammock), and after doing some reading it dawned on me that he was over tired and over stimulated. I had been putting off getting him into a routine as it was looking like he could manage what we had been doing for the last 7 weeks. But now it was time for some sleep training. On Wednesday morning I once again tried leaving him to cry for his morning nap, and once again I was in tears. 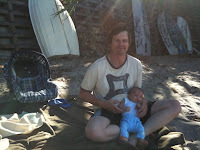 Out of desperation I called my good friend Justine in Brisbane (who has an 11 week old). She does not believe in the CIO (crying it out) method, and suggested there are other gentler ways, including one where you pick your child up and put them down as often as required until they fall asleep. So upon doing further research I found the Tracy Hogg's method. I have learnt so much from the forum regarding the E.A.S.Y. routine and the pat/shush and pick up/put down method. So now I am trying to implement this. Today is day two and a half, and I am still persevering. The last 2 nights his bedtime routine has been a bath, massage, feed, music, and pat/shush until he is asleep at 20:30ish. He is still waking up every 2-3 hours for a feed but at least he goes back to sleep. His morning nap has been the easiest to get him to sleep. For his second nap I have again resorted to putting him in my sling as I don't want him to be exhausted and over stimulated/tired. For his third nap it was relatively painless (although he could not self soothe himself into another sleep cycle, so he woke up and cried). He is now on his forth nap and it was quite a mission, and he has now got his pacifier. I am hoping this is going to get better and easier as the days go on. The Plunket nurse came to see us today for the first time. He was weighed (he did not put on any weight this week, and he is under the 15th percentile according to WHO child growth standards), measured (he is now 58.5cm so he is around the 75th percentile), and a general check of hearing and sight. So essentially he is a long skinny baby, exactly the same as what the prenatal scans determined when he was still a foetus in my womb). I have had a tickle in my throat for two days which has made things harder. I decided to use the Vicks First Defence, however the instructions say to consult a doctor if pregnant or breastfeeding prior to use. Since I have not been able to manage this Kien has been consuming the frozen breast milk, and I have been pumping and biffing (which seems like such a waste but better that than risk any issues for the baby). *Groan* I thought after the 6 week mark it was supposed to be easier, not harder! Yesterday Janet from Birthcare came to visit us for the last time. Kien was weighed and measured. He is now 4350 grams, with a head circumference of 38cm, and his length being 57cm (which Janet says is above average). The picture above is Kien on the scales. Today we went down to the restaurant to visit ông and bà ngoại (grandpa and grandma on the mother's side). Kien slept in the car seat on the way there, and for about an hour after we arrived. He was very well behaved when he woke up, and was passed around for some cuddles. We had the most glorious weather today, and when Jef came home from work we went to our local beach 36.84099S,174.73466E. This is the first time since Kien was born that we have been to the beach, and he had a little dip in the water. Yesterday Jef, Kien and I went for a walk around Bayfield Park (Cox's Bay reserve). It was a great stroll, and we sat and watched some amateur cricket. It is the pinnacle of summer when you can meander through a reserve to find club cricket being played. 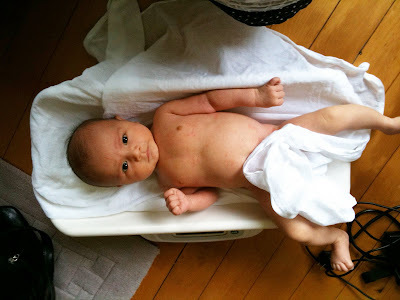 Kien was weighed on Friday by the midwife, and he is now 4200 grams, or 9 pounds 4 ounces. He has really filled out and now looks quite chubby. 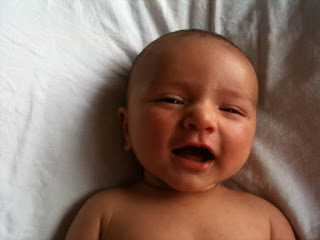 He is also very active when he is awake; arms are waving up and down, legs are kicking back and forth. Even when he is asleep he can kick himself out of the cloth I swaddle him in. It has been 3 nights now that I have started swaddling him again, and he has been dropping off to sleep without any dramas. He used to hate being swaddled so I stopped doing it in the first week of being home. In the last couple of weeks he became so agitated at night when I tried putting him to sleep. I re-read the following article on infant sleeping aids. Last night at 21:00 I swaddled him, put him in his cot and gave him a bottle. He dosed off, then when he awoke 5 minutes later I picked him up, rocked him a little bit and then put him back in his cot. After that I got 3 hours sleep. 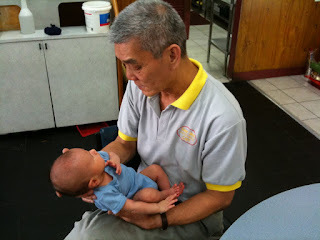 Jef looked after Kien this morning from 6am - midday while I caught up on some sleep. It was so great, thanks so much Jef for being such a great partner and dad. I have just finished feeding Kien a bottle. What is significant about this is that it is the first time during the night he has managed to stretch out to four hours...this is quite a major development indeed since it means I can look forward to more sleep from here on in. What is also interesting to note is that this has happened exactly 5 weeks after he was born. It is amazing how quickly they develop! Jef wondered whether Kien could fit into a scooter helmet - guess so! We had lots of visitors this weekend; David, Lynne and Sarah stopped by on Saturday, Gilbert and Chris Twemlow came through yesterday morning, Craig and Rozanna called in yesterday afternoon, as well as Mum, Rod, Michelle and Sandra. It was so nice to see everyone, especially the family! Today we took Kien to the restaurant to see Dad. This was the first time we have been to the shop since he was born. It was a successful exercise, although he got a little aggregated when we first got there since it was so humid. 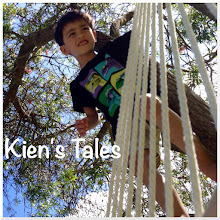 Kien really does take after his dad; he gets hot very quickly and doesn't require many layers of clothing. We are supposed to dress babies one layer more than what we are wearing, but I dress Kien one layer less, and gauge the temperature for his comfort based on Jef. This is working out well so far.